For more than 10 years, our customers have looked to Bill Gaw as a trusted developer of lean manufacturing tutorials, seminars, courses and training materials. Training options that help improve the spirit and performance of individuals, teams, organizations and companies. * Does your company need to increase speed, improve quality while reducing operating costs? * Does your team want to eliminate the high cost and mega stress of end-of-thmonth scrambling? * Does your systems results need improvement? * Do you want to gain control of your day-to-day activities and create a fun work environment? * Are your engineering and sales processes slow? * Does everyone want to reach their full growth and earnings potential? If you answered YES to any of these questions, you no doubt will find value for whatever time you spend reviewing the content of this Web page. If you are in search of a better way to run your business, you have come to the right place. Here you will find Bill Gaw's Sales & Operations Planning PowerPoint T-Presentation... an Training Tutorial to help individuals and companies exceed their goals and expectations. * Reach your full growth and earnings potentials. Most training materials today are either Adobe .pdf books with little or no effective graphics, PowerPoint T-Presentation with no commentary to explain the content of the slides, videos that tell you what to do but with very little implementation and/or optimization �How To,� and seminars that present a lot of materials but most attendee�s retention rate is less than 25%. Bill Gaw's lean manufacturing PowerPoint presentation on the other hand includes powerful, PowerPoint charts and graphics, "plus" annotated note pages with slide commentary and "lessons learned" by a "been there, done that" manufacturing professional. Real world implementation and optimization training for individuals... anywhere... anytime... anyplace. "Bill Gaw's lean manufacturing PowerPoint presentation is focused on the "how to." Unlike other training materials that tell you only what you need to do... Bill's training tutorial presents what you need to do and then he shows you	how to do it." 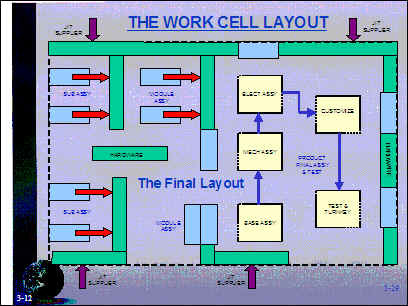 Slide 3-12 presents the initial layout for our case study company�s sequential production project. Note that just-in-time (JIT) suppliers will feed their parts, components and sub-assemblies directly to the work cell sub-assembly, mod-ule assembly and final assembly areas. Production will flow from sub-assembly areas to tutorial build areas to the final assembly areas. All parts are off the floor�stored on racks and moved in accordance with a JIT pull-system. Final assembly and test are accomplished in five work stations that have been balanced to each other and to the sub-assembly/tutorial feeder lines. Lesson Learned: To be successful in the startup of a sequential production line, we must first walk before we run. If we do not have parts suppliers that can support a JIT pull-system, then we must still use our stockroom to store excess support materials until suppliers come up to speed. It is not uncommon to increase inventory levels at the start of a sequential production project to assure adequate material availability. However, as we manage our supplier development program, and supply lines become stable, inventory will be reduced significantly to below prior history. "Your WCM Training tutorials are the easiest and fastest way to understand the practicalities of business processes that I have seen in many years of management consulting activity. I intend to use them in my practice, if you are agreable, since I am now extending into new consulting areas." We are so sure that your Sales and Operations, PowerPoint, Training Presentation will have the impact you desire that you can order entirely at our risk. This Sales and Operations, PowerPoint, Training Presentation comes with a No Risk, 100% Unconditional Money-Back Guarantee. This is a Lifetime 100% Money- Back Guarantee! Believe this, we will never consider your purchase binding until you have reviewed all the material and put it into practice. We know that you, like our other customers, will be thrilled with the results. In fact, we are so convinced that this Training tutorial will work for you that if you aren't completely satisfied for any reason at any time, we'll immediately refund your purchase price. You simply can't lose. If you feel that this offer is not for you, forward it to your leaders and we will immediately email you a download copy of " How to Survive in an Entirely New Economy." library of APICS nor in the Harvard Business School Press.